One thing we know here at Lifebox is that safe surgery means team work. Our small but mighty team is made up of colleagues from different backgrounds and specialities, all with a common goal to help make surgery safer worldwide. Introducing Dr Ed Fitzgerald: surgeon, health consultant and Lifebox honorary clinical advisor. 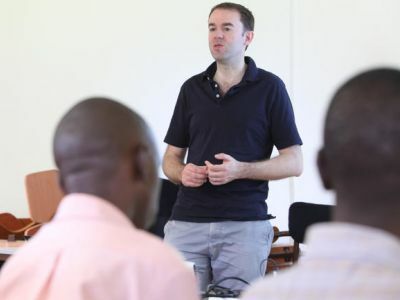 We recently caught up with Ed after listening to his brilliant Simnovate podcast in which he talks about delivering safe surgical care in low resource countries and the work Lifebox is doing to support colleagues on the frontline. 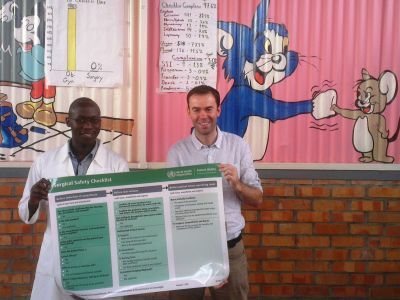 Earlier this year Ed travelled to Rwanda where he lead surgical skills training and followed up on the use of the Surgical Safety Checklist and Lifebox pulse oximeters. Read our interview with him below to learn more about this trip and his role in supporting safe surgery around the world. As Lifebox’s honorary clinical advisor you’ve played an active role in Checklist implementation in Rwanda, Republic of Congo, and Madagascar. Why is the Checklist such a vital tool for safe surgery around the world? The Surgical Safety Checklist has defined a gold standard for safe perioperative practice, and that standard applies in which ever country or operating theatre you’re in. But the Checklist plays a really important role in low and middle income countries particularly, in defining standards that might be aspirational. Being able to go into an operating theatre, meet the team and work with them to see where their practice currently sits against those standards – and where they want to be – is really powerful for improving surgical safety. 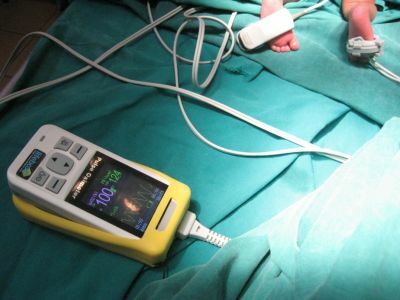 You returned to Rwanda recently to follow up on some of the Checklist and oximetry work Lifebox has been involved with, as well as lead surgical skills training. How did you find this experience and did you see any of the Lifebox pulse oximeters in action? This was my sixth visit to Rwanda since first setting out to Kigali when I started working with Lifebox. I visited CHUK hospital in central Kigali and Kibagabaga on the outskirts, where my predecessor was involved in the first Lifebox-led overseas implementation of the Checklist. I was following up on its use at both hospitals. It has been really interesting to go back over a period of time to see how things have, and are, changing for the better. I spent time in Kibagabaga chatting with some staff, anaesthetic nurses and residents, and it was really pleasing to hear that the Checklist is still in use there. It’s becoming more embedded in their work because the junior staff coming through are now taught and trained and aware of the Checklist – so for them it’s becoming habit and that’s fantastic to see. Kibagabaga has remained really supportive of the work that Lifebox has done over there, and I think they are appreciative and observant of the fact that we keep coming back to spend more time together, and to check up on how things are going. We were very pleased to donate another pulse oximeter totheir nursing staff, which will help support their huge clinical work load. Just in terms of Caesarean sections alone they are performing about 240 a month. At CHUK, before I first worked on implementing the Checklist, there had been previous efforts to get that up and running. It’s a University Teaching Hospital, much larger and busier than Kibagabaga so the dynamic is different and change doesn’t always come easily in this type of environment. However the ongoing support for the Checklist is strong – which is really good to see. They have full use of over 20 Lifebox pulse oximeters that were previously distributed by CAS IEF. It was fantastic to walk into the recovery rooms, from obstetric to paediatrics, and see these being used. What is the government’s role in supporting safer surgery in Rwanda? There’s no doubt that part of the strength of implementing the Checklist in Rwanda is that the government has strongly supported it and mandated that hospitals will use it. That’s a great facilitator for trying to encouraged uptake. I know that the Lifebox team has previously met with the health minister regarding pulse oximeter donation and they’ve been very strongly supportive of the work we are trying to do. You wear many global surgery hats including that of past president of ASiT – how do you see the global surgical role interacting with anaesthesia and nursing? Personally, I’ve been very lucky in terms of timing – because if you’d talked about global surgery three or four years ago as any sort of recognised specialty it didn’t really exist, and it has been that way for over 40 years. So I have been very fortunate to become involved with Lifebox and build on my interest during a period when the Lancet Commission on Global Surgery has reported, and there’s been a huge international groundswell of support for this area. Global surgery does not exist without anaesthesia and nursing and we shouldn’t think of it in isolation. The recognition of the need to support these staff and the training that goes into providing the capacity for safe surgery beyond just the surgery itself – this really reflects the health system as a whole and everything that’s required to support it. As a surgeon, why do you think it’s important to support colleagues is low resource settings? One of the main reasons global surgery hasn’t been a greater priority over the decades prior to this is that perhaps the wider profession hasn’t recognised the need. You’ve got to look at the reasons behind that; certainly one big issue is simply a lack of knowledge, awareness and data around the situation in these settings, and I think without understanding the problem you can’t manage it. However that has been changing in the past few years and there’s a much greater understanding around outcomes following surgery, work force capacity and system short comings. Another project I’m involved with, GlobalSurg, has helped put some numbers to that – leading to a wider recognition of the issues across the surgical profession with increasing support. What do you think needs to be done to keep this momentum going? I think there are many looking to help, and one of the difficulties currently is that people aren’t sure how to, or who to contact. There also needs to be recognition of time and training commitments – it’s difficult for people to find the opportunity to play a bigger part as much as they might like to. There is certainly a need for more advocacy to help link people to organisations that are working in global surgery and to spread the understanding that this is an important area that needs to be addressed. There’s a lot of opportunities for looking at new ways of working to support both trainees and consultants working in this field – particularly linking them to organisations here in the UK or other high income countries that can still provide that support without necessarily putting feet on the ground. It’s a long-term change and it’s very pleasing to see so much enthusiasm and support for a new generation of trainees who will hopefully carry that through their careers. What advice would you give to medical students looking to specialise in surgery? Is global surgery the future of the profession? I think global surgery is going to really open up in the years ahead as a huge area of focus that crosses boundaries between specialties such as public health, surgery and anaesthesia – and I think that’s quite an exciting juncture at which to be working. There is a huge amount of activity to be done in helping advocate, promote, research, implement and deliver the changes that are required to help build up surgical health systems in low and middle income countries. One of the ways medical students can get involved in making a real difference to hospitals around the world is through the Lifebox-Medsin rep scheme which offers them the opportunity to advocate for and raise awareness at their own universities. What does safe surgery mean to you? Safe surgery for me is about respecting the trust that a patient puts in you to care for them when they are having their operation. It’s about being able to build a system that has the capacity to provide adequate, appropriate safety measures to prevent unnecessary complications or death.